Some old photos that do belong here. That's funny...someone emailed me today with a set. I'm thinking new technology unless that is the best rod I can get my hands on. Maybe BME. How recent are the photos and who is the lucky guy? I don't know who that guy is. Maybe RC could shed some light on that one. 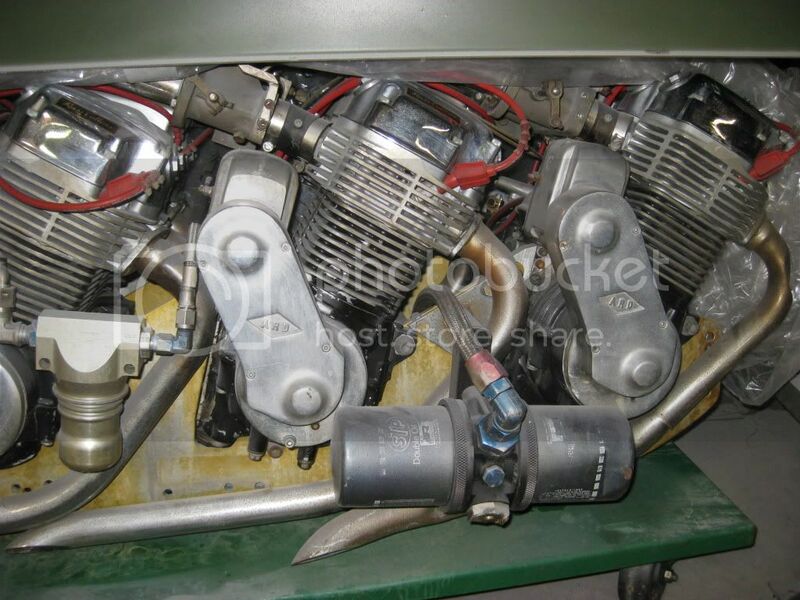 These were some photos that I dug up somewhere a while ago (possibly on the net) after a couple of young fellas who like to tinker with motorcycle engines, were asking about the RC phenomenon. I was thinking that nothing could be more educational and inspirational than something like this. Somewhere, somebody wrote that when AT&SF was launched, it was like a shot that could be heard around the world. That put a huge on their faces. Thanks Jay...that's my thinking...all new bullets and rods. Sources like that may be just the ticket. This pretty much how the triple looks right now....in fact it is on the same dolly under my bench/ place of honor. It's very distracting as I toil over the other project..it's just begging to run off to a chassis shop! Fantastic Project! Resurrecting a LEGEND!! What happened to the rest of the bike? Crash? Past its prime and scrapped for other projects? Stolen? Thanks, Sam.. I had figured that was it's demise, but the powerplant seems unscathed. I'm just taking a guess here and its all by the look of the motors... were the fins ground down to shave weight? They look much thicker on the edges than normal and that is what I'm thinking is the reason. 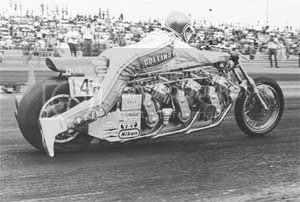 Drag bike....not to worried about air cooling and we need the room...that is 3 motors that need to be very close together..my dad is 5'7" tall...coincidentally...so I am I. Needed the room for plumbing, headers etc....Bike below....you see the length issue! Do you know who built the original frames fopr A,T, &SF..and the Sorcerer ? Who is doing the new one and will it look like the old one? 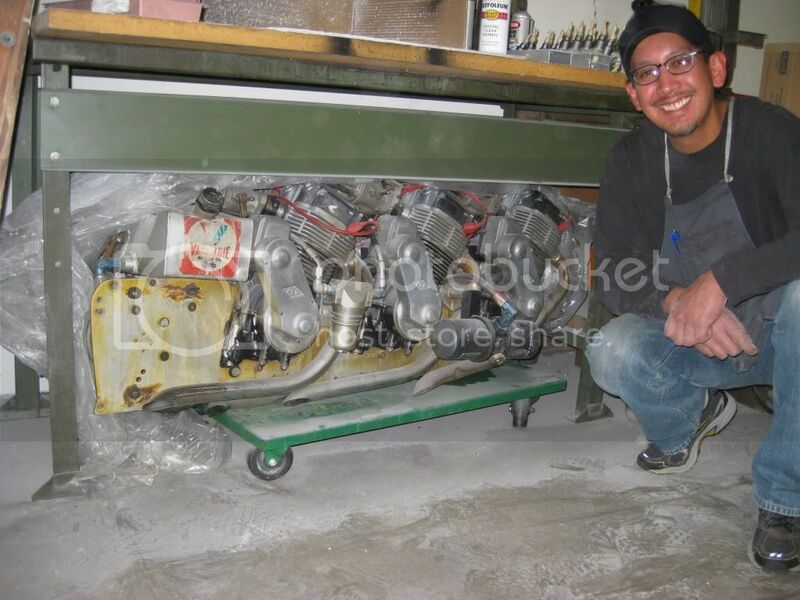 Did you ever see the pre-photoshop rendition of the 5 engine ATS? It was really well done and fooled a lot of people. Really stretched ole Russ out. I went out and checked under my bench. nope, just a couple old powerglides. Everything will be restored to the original look...we will cheat a little for reliability and safety but you will not know the difference. Don Long built the Sorcerer chassis....very nice work...Google him...he's the Man. I can't recall who built the triple chassis..I have a pretty good guess but I do not want to insult anyone. I do remember pushing on the TIG peddle while my Dad was welding on that thing. I spent a lot of summer nights in that shop in Gardena working with him. 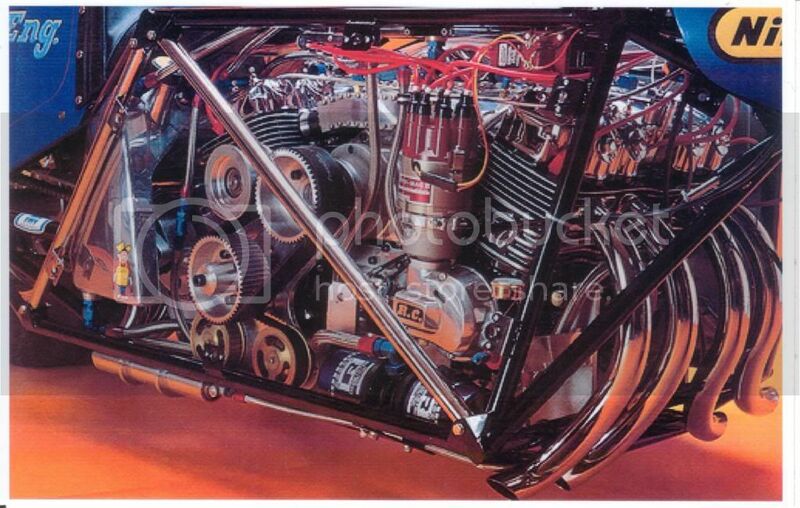 Back in the day, the RC pistons were made by Arias. Altho they are all but out of the motyorcycle piston business, you might hit them up. OK all of you R.C. ENGINEERING fans, here's your chance to own a piece of historic memorabilia !! !